Northwestern Bank has upgraded its VISA Debit Cards to chip technology. What does this mean for you? The new chip provides additional protection from fraud when you make a card present purchase on a chip enabled terminal, keeping your account more secure. Why is NWB converting to chip-enabled Debit Cards? Chip technology is safer for customers to use. The chip encrypts customer data when used at chip-enabled terminals, making it much tougher for hackers and identity thieves to steal your information. The card is also already widely accepted in other countries, and is quickly becoming a standard in the U.S. — meaning your card will be easier to use overseas or at home, everywhere chip technology is accepted. When I receive my new chip card, how do I use it? Call Northwestern Bank at (712) 737-4911 (Orange City) or (712) 324-5141 (Sheldon) during business hours (Monday-Friday 8:00am-5:00pm). After hours, call toll-free (800) 236-2442 to activate. IMPORTANT NOTICE: For security reasons, destroy your old Card(s) immediately. Step 2: Keep your card in the terminal throughout the transaction and follow the prompts on the screen. Step 3: Remove your card when prompted and take your receipt. You may need to sign for your purchase. The chip-enabled VISA Debit Card can also still be used traditionally, with a magnetic strip on the back for swiping. I don’t have the new card yet. Will my current NWB VISA Debit Card still work? Yes, your current VISA Debit Card will continue to work normally, until it expires. When the time comes to renew your card, Northwestern Bank will send you a new, chip-enabled card in the mail. Will my card or information or PIN change? If you already have a VISA Debit Card, your card number and PIN will not change. Your new card will have a new expiration date and 3-digit security code. Anywhere chip technology is accepted. At the payment terminal, you will be able to tell by the card slot that is usually positioned at the bottom of the device. There will likely be an illustration prompting you to insert the chip-end of your card face-up into the terminal. You can also continue to make purchases online, using your standard card number, expiration date and 3-digit security code located on the back of your card. Yes, the chip-enabled VISA Debit Card also comes with the traditional, magnetic strip on the back that can be used for swiping. However, if you have the option to pay by inserting your chip, rather than swiping, NWB recommends that you use the chip since it is a more secure option. How does chip technology better protect my information? The biggest benefit of chip cards is the reduction in card-present card fraud resulting from counterfeit, lost, and stolen cards. Chip cards store payment information in a secure chip rather than on a magnetic stripe and the personalization of chip cards is done using issuer-specific keys. 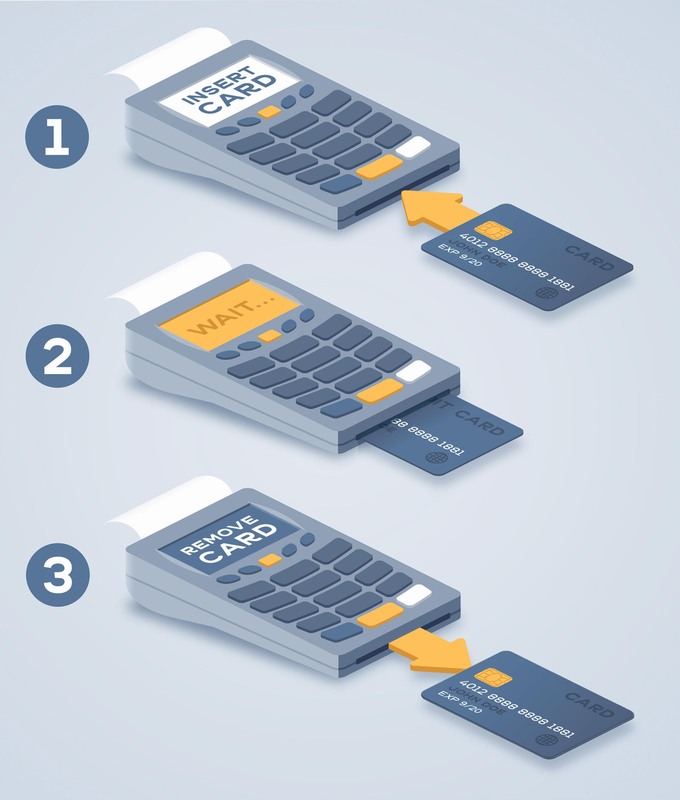 Unlike a magnetic stripe card, it is virtually impossible to create a counterfeit chip card that can be used to conduct a payment transaction successfully. You will also continue to have a PIN associated with your card, which adds another layer of security. To report a lost or stolen card, immediately notify Northwestern Bank by calling (712) 324-5141 (Sheldon) or (712) 737-4911 (Orange City) during business hours (Monday-Friday 8:00am-5:00pm). After hours, call toll-free (800) 236-2442. We're here to help. If you have any questions about the new chip enabled VISA Debit Cards, call (712) 324-5141 (Sheldon) or (712) 737-4911 (Orange City) during business hours, (800) 236-2442 toll-free after hours or contact Northwestern Bank online.